Place squash on a baking sheet with a silpat and roast for 20- 30 minutes, or until squash is soft. Set aside. In a medium fry pan combine 2 tablespoons of coconut oil with shallots and saute over medium/low heat until softened. Add garlic and cook additional two minutes. 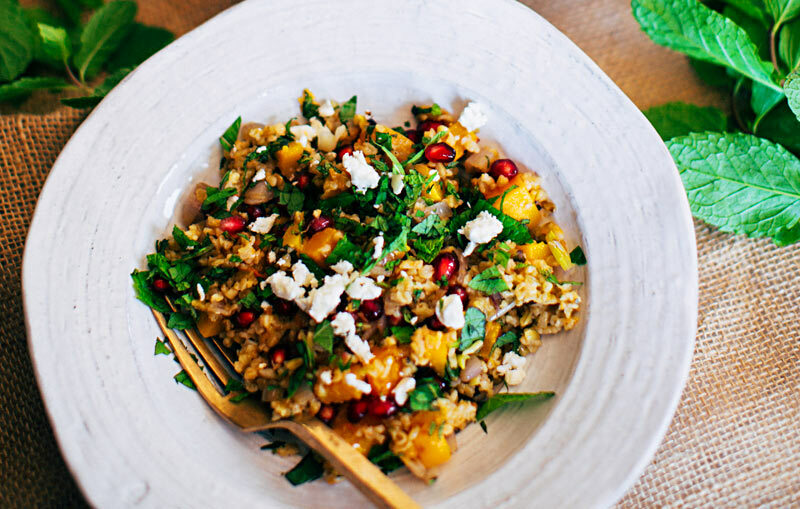 Add freekeh to pan and saute for an additional 2-3 minutes. 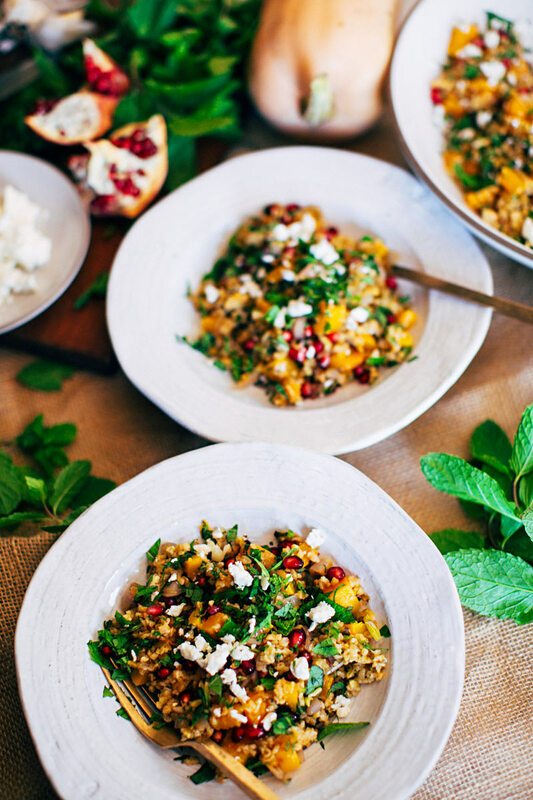 In a large serving bowl combine freekeh and butternut squash. 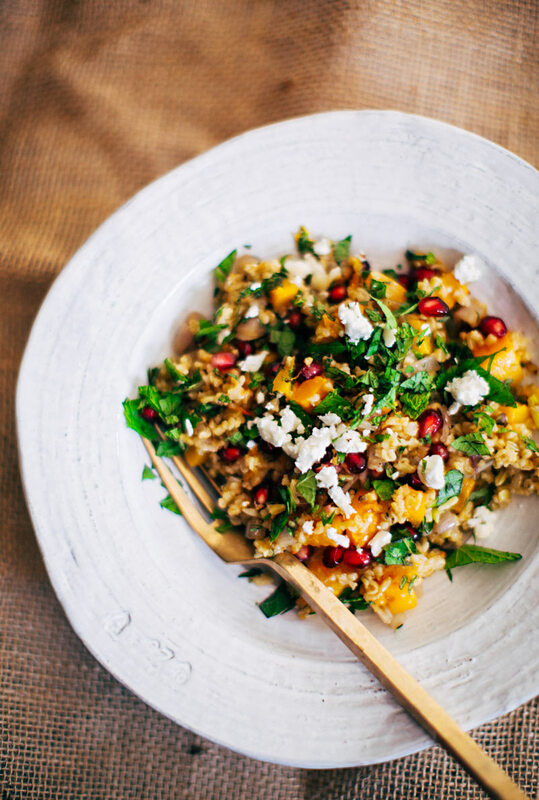 Allow to cool to warm, then add pomegranates and mint, fresh cracked pepper and sea salt to taste. Give it a good toss. 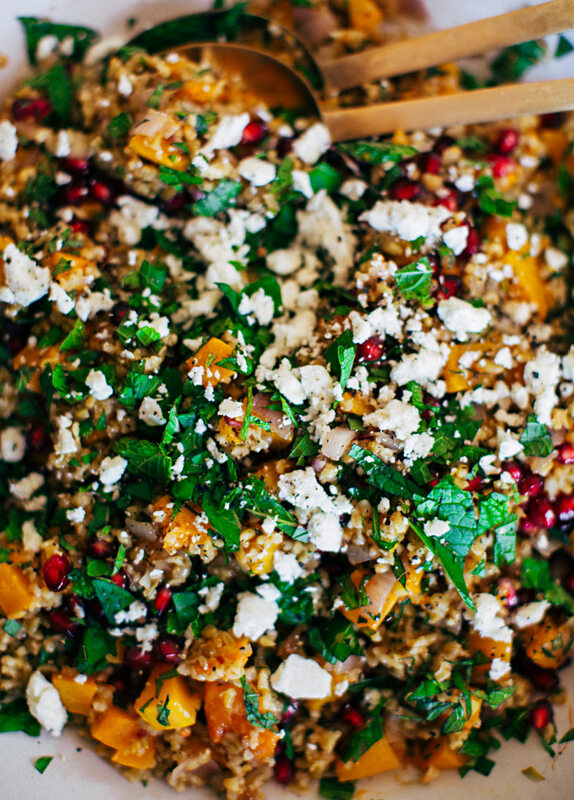 Garnish with mint and feta. Enjoy warm. This is just gorgeous, Sarah! Pomegranate and mint?! LOVE. I’ve never heard of freekeh. This looks absolutely delicious! Anything with feta is good in my book and we just happen to have mint growing in our backyard so I need to make this for my family 🙂 Thanks for the inspo! I made this salad over the weekend and it was DELICIOUS!! Except my local grocery store didn’t have freekeh, so I used farro instead, which gave it a nice nutty flavor. I highly recommend making this salad; thanks for the tasty recipe, Sarah!! Made this last night, best salad I’ve had in a long time. Kept thinking about it all day! Thank you for the recipe! 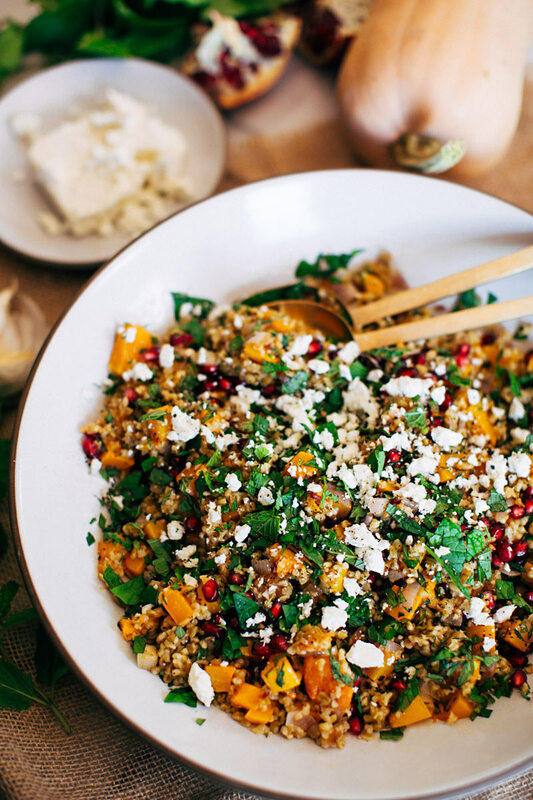 Delicious recipe – I had to adjust ingredients b/c I didn’t have Freekeh, Butternut or pomegranate seeds. Instead I used a wild rice mix, delicata squash and I threw in some dried tart cherries. It was so good! Even my husband who thumbs up his nose every time i serve up winter squash liked it. The mint and feta make this recipe so don’t skip it. I will make it again with the correct ingredients once I get to the store. Thanks for sharing!